If you’ve found your way here, you’re probably wondering how to cook filet mignon. Like most people, you’re probably curious about the best ways to prepare filet mignon. Luckily for you, filet mignon can easily become part of one of the most delicious treats anyone could cook. And what is this delicious treat? The Bacon-Wrapped Filet Mignon! To cook Bacon-Wrapped Filet Mignon, remove all skin or fat from the meat, then season the meat with a small amount of salt and pepper; quantities at your discretion. Next wrap the steaks in wide strips of bacon, and stick a toothpick through them to help them retain the shape and snug fit around the Filet Mignons. Heat up a frying man to medium while adding a little butter to the pan. Once the butter has melted down, add the steaks. Cook them until they are brown, flipping once. Next, place the steaks in the oven at 400 degrees. Check on them in 5 to 10 minute intervals while they are in the oven until they are at the desired tenderness. Let them air out on a rack, and loosely place aluminum foil over them. Your Bacon-Wrapped Filet Mignon is now ready to serve. This is the perfect way to prepare filet mignon because while cooking the bacon and filet mignon together, the flavor of the bacon sinks in. 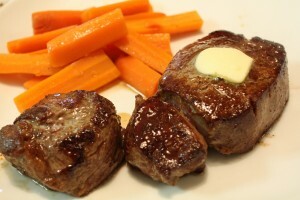 It’s also the perfect match because the filet mignon lacks fat, which usually keeps meat from drying out. The bacon helps the filet mignon retain its juiciness. It would go great with a firm red wine like a Cabernet Sauvignon. And don’t feel bad eating it; filet mignon has the lowest fat count of any beef cut and has been shown to be good for heart-health.